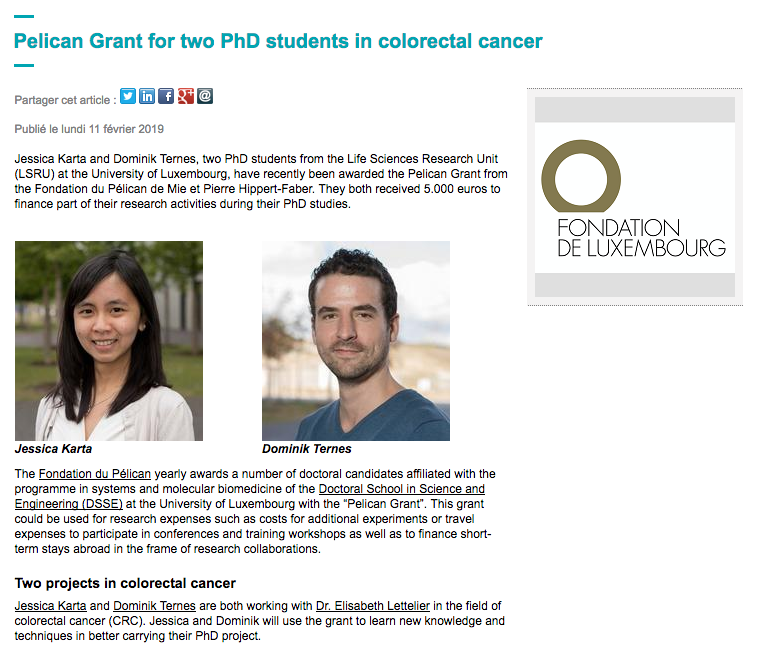 The Fondation du Pélican yearly awards a number of doctoral candidates affiliated with the programme in systems and molecular biomedicine of the Doctoral School in Science and Engineering (DSSE) at the University of Luxembourg with the “Pelican Grant”. This grant could be used for research expenses such as costs for additional experiments or travel expenses to participate in conferences and training workshops as well as to finance short-term stays abroad in the frame of research collaborations. Jessica Karta and Dominik Ternes are both working with Dr. Elisabeth Lettelier in the field of colorectal cancer (CRC). Jessica and Dominik will use the grant to learn new knowledge and techniques in better carrying their PhD project.